“Hunters Downstream” is my latest experiment where I got the chance to collaborate with writer Sarah Woolner, composer Hutch Demouilpied and actor Penelope McGhie. I wanted to create a fully immersive environment, to guide you through a journey across 5 different physical spaces/rooms where you would navigate inside a memory. It is an installation, it is a journey, it is a spectacle…. and a mixture of a lot of other stuff. I wanted to be playful, I wanted to capture a memory in its raw state: feeling images, repetition, sounds and the perception of memories more leaning towards the language of dream than the one of reality and film. I feel this is the beginning of a new journey where I can start to explore immersive experiences. So in short, “Hunters Downstream” is an immersive multimedia installation combining projected animation, miniature sets, kinetic sculptures and soundscapes. The installation merges film, theatre, sculpture and drawings to create something that is its own kind of spectacle. “Hunters Downstream”, the exhibition opened on the 16 May 2015 at Watford Museum, England, UK. The installation was funded by www.watfordmuseum.org.uk for Museum at Night & Culture 24. The Event was part of Museum at Night at Watford Museum and was funded by Watford Museum. This works could have not being created without the support and enthusiasm of the museum staff! 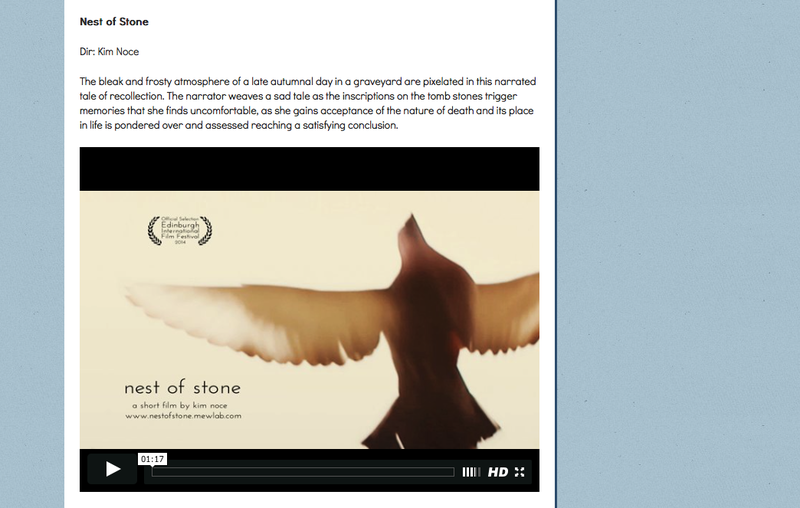 “Nest of Stone” has been selected to screen in competition as part of Encounters Short Film and Animation Festival 2014 and it is eligible for the Encounters Grand Prix Award and may also be eligible for other awards It allows the film to participate for the BAFTAs, the Oscars®, the European Film Awards and the Cartoon d’Or. The full programme will be screened at Watershed in Bristol (16-21 September 2014), with the awards being announced during our Awards Ceremony on Saturday 20 September. 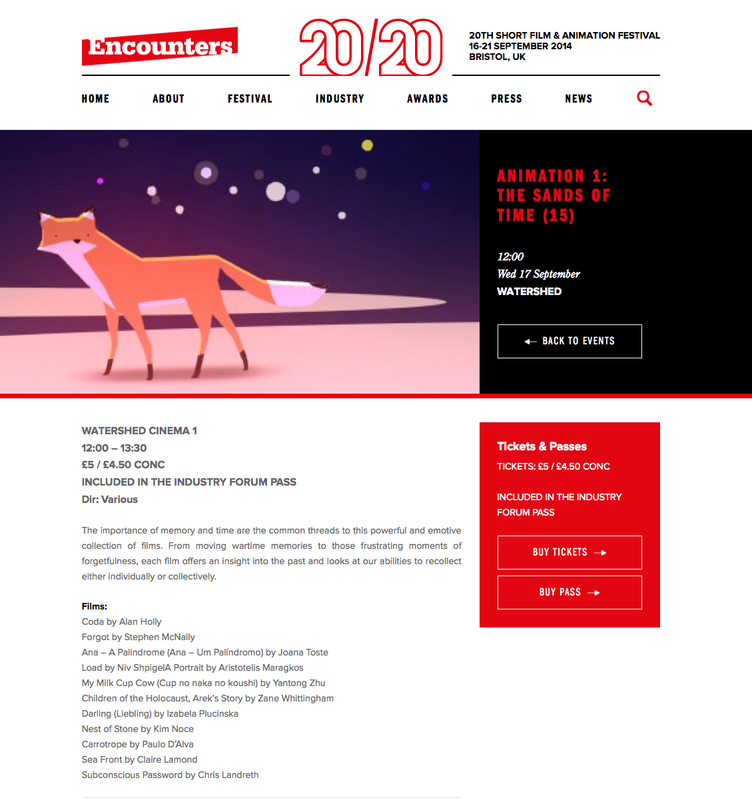 Encounters Festival is the UK’s leading short film and animation festival, and the annual meeting place for filmmakers and industry professionals. Based in Bristol, UK, Encounters runs a six day festival in September and its main venues are Watershed and Arnolfini, on Bristol’s scenic Harbourside. Encounters Festival is the leading UK gateway to the world’s most prestigious short film and animation awards, and nominated filmmakers qualify for the BAFTAs, the Oscars®, the European Film Awards and the Cartoon d’Or. Encounters Festival presents an annual International Competition showing the best new short and animated films from around the world, an Industry Forum offering masterclasses, panels and networking for filmmakers and professionals and an inspiring festival programme of screenings and events for everyone to enjoy. So whether you are a filmmaker looking to launch or develop your career, an Industry professional wanting to stay abreast of what’s new or you are a film lover and want to soak up the festival atmosphere by watching great films and special events, check out our online programme to find out what’s happening at Encounters Festival 2014. 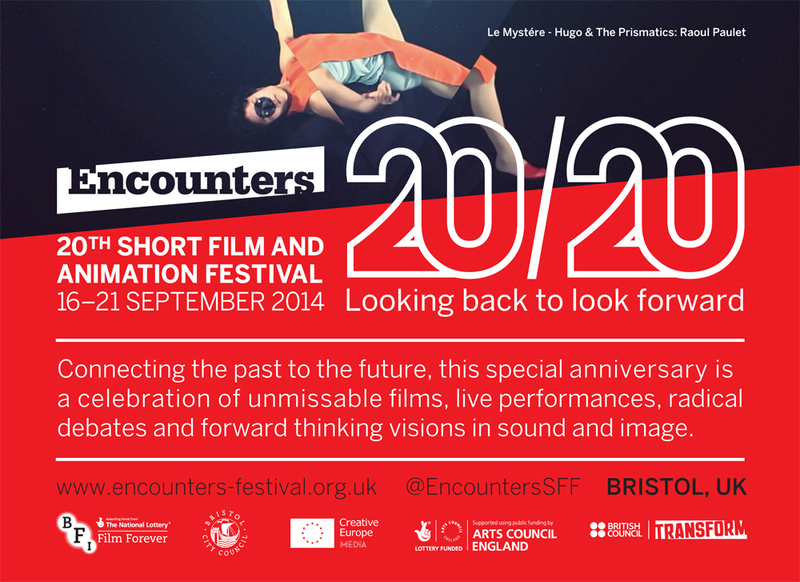 In 2014 Encounters Festival celebrates 20 years as the UK’s leading short film and animation festival, presenting 20/20: Looking back to look forward. 20/20 Looking back to look forward connects the past to the future, presenting a special anniversary celebration of unmissable films, live performances, radical debates and forward thinking visions in sound and image. The Edinburgh International Film Festival (EIFF) is an annual fortnight of cinema screenings and related events taking place each June. Established in 1947, it is the world’s oldest continually running film festival.The EIFF presents both UK and international films (all titles are World, International, European or UK Premieres), in all genres and lengths. EIFF 2014 will the Festival’s 68th Edition and runs 18–29 June 2014. 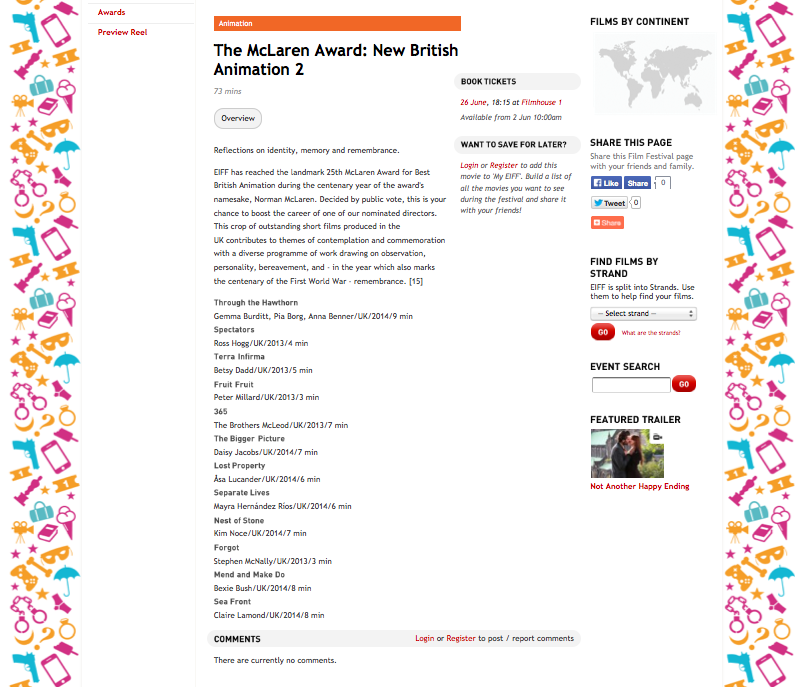 The 2014 Edition will feature activity from the McLaren 2014 Centenary Celebrations, a Scotland-wide project celebrating the centenary of the trailblazing artist, animator, musician Norman McLaren. Born in Stirling, Scotland McLaren spent much of his time in Canada where he helped to set up the National Film Board of Canada (NFB). McLaren 2014 is led by EIFF’s Animation Programmer Iain Gardner and will take place at venues throughout Scotland from April 2014. I am delighted as a part of Bird Eye View Film Festival, my film High Above the Sky ( co-directed with Shaun Clark) will be screened at the BFI on the 13 April at 2.pm amongst 7 other short films including Joanna Quinn’s BAFTA-winning, Oscar® nominated FAMOUS FRED. The screening will be preceded by a ‘MAKE-YOUR-OWN ANIMATION’ WORKSHOP – a unique chance for kids to bring their own animations to life, with a WORLD PREMIERE OF THE RESULTING FILM showing on the BIG SCREEN! 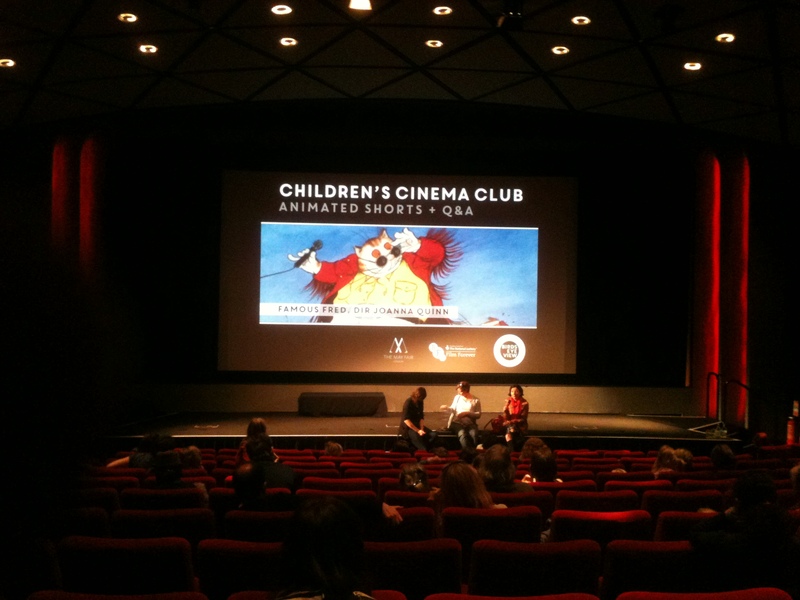 The event will also feature more great animated shorts for children and a chance to speak directly to filmmakers in a Q&A SESSION. I am currently co-directing & animating a 6 minute piece with Shaun Clark for a MewLab commission. The characters were created by Shaun, and they are very playful little 2D/3D creatures, a pleasure to animate! I am currently designing the overall aesthetic look and animating a dance phrase for a 10 minutes dance piece for Dance Digital. These will include costume design & make up. The animation will be projected and integrated with the dance routine.